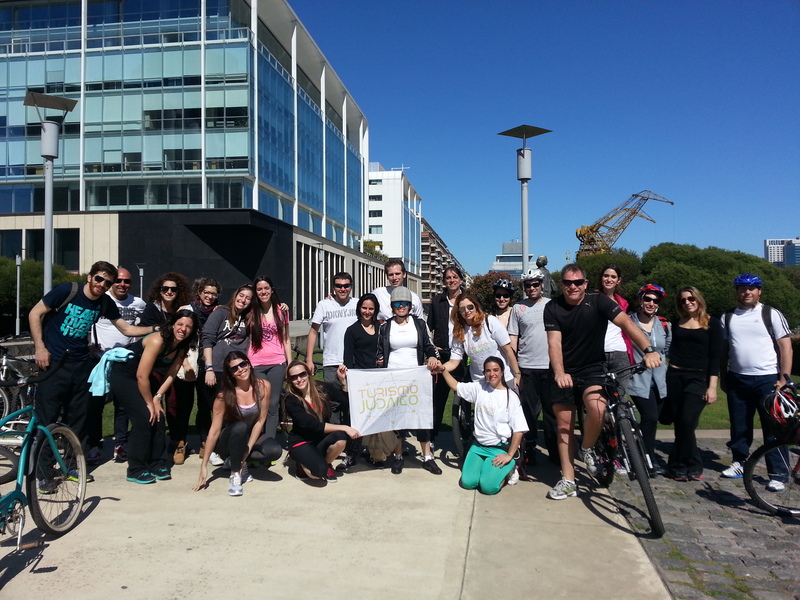 The last sunday September 6 2015, Judaic Tourism organized the second Judaic City Tour by bike to celebrate Rosh Hashana. Closely related to the mission of transforming Jewish sites into interesting travel sights, this activity aimed the same goal: tour the city of Buenos Aires, visiting Jewish monuments and sites in public places, learning about these places and knowing about the history and life of the Jewish community in Argentina. The tour started in the Square Baron Hirsch, then we visited the Memorial of the Shoah in Centennial Park. Then we rode to the Hebraica Institution to meet the sculptural friezes that speak about peace at its entrance. The next destination was the subway station wich recently changed its name to "Station memory" in tribute to those killed in the bombing of the AMIA, with a show called "Illustrated memory, art calls for justice in the subway." Then we passed the Libertad Temple and went to know and understand the meaning of the monument in Memory Active in lavalle Square in front of the courts. From there we cycled to Puerto Madero to see the statue of Anne Frank, in the square Queen of Holland. Finally we passed the entrance to the Museum Old Hotel immigrant and then cycled to the square where we finalized the trip. But before we get ... we met one last monument of the hero without grave, the Swedish diplomat Raoul Wallenberg. The bicycle tour ended in celebration of Rosh Hashana Urbano, organized by Limud BA, where we had lunch together a delicious jewish food and we stayed to enjoy the cultural offerings that were developed in the square to celebrate together the arrival of 5776.